According to the most recent fall color report, the following state parks are at peak color. The rest of the state is approaching peak color. Beginning the last week of September, the Ohio Dept. of Natural Resources shares information about the state of fall color throughout the state at Fall Color Report. At least that’s is how fall color develops in theory. In practice I have noticed that peak fall color often arrives at the end of the second full week of October throughout much of the state. We get our best fall color when there is a decent amount of rain throughout the growing season and when autumn days are bright and sunny, while autumn nights are cold, but not freezing. Some of the earliest displays of fall color are seen in these two vines: Poison Ivy and Virginia Creeper, both of which can turn bright red. Among early changing trees are the sycamore and cottonwood. These trees are found in low-lying areas and turn yellow. And the Ohio Buckeye Tree also shows color early, with leaves varying from golden to red hues. At near peak fall color the leaves on our hickory and yellow poplar trees turn yellow. Maple trees often show off dazzling reds. Great destinations include hilly terrain, shorelines, tree lines at the edge of fields, and fire towers. 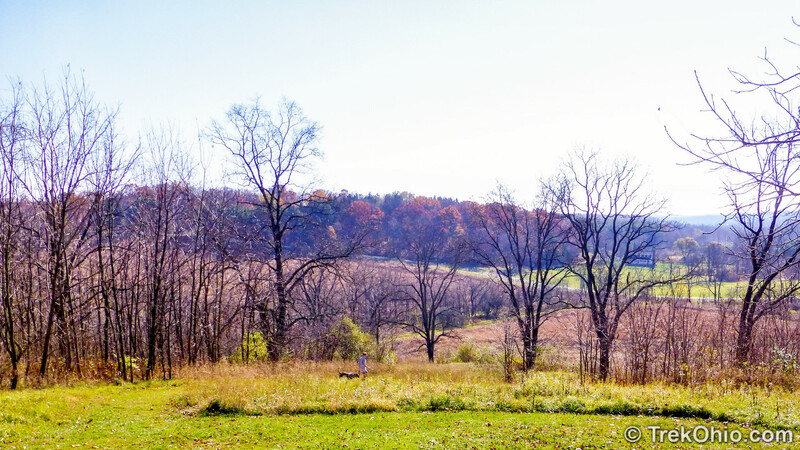 At TrekOhio we’ve posted a list of Ohio’s Scenic Overlooks that you might want to consider as possible viewing destinations. 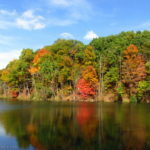 The Ohio Department of Natural Resources (ODNR) also publishes Fall Foliage Reports to help you find colorful, fall locales. Among other things, they suggest routes for Fall Color Driving Tours and identify some of the state’s fire towers that provide great views. If you live in or near Lake County, you might want to look at some of their suggested fall-color hikes. 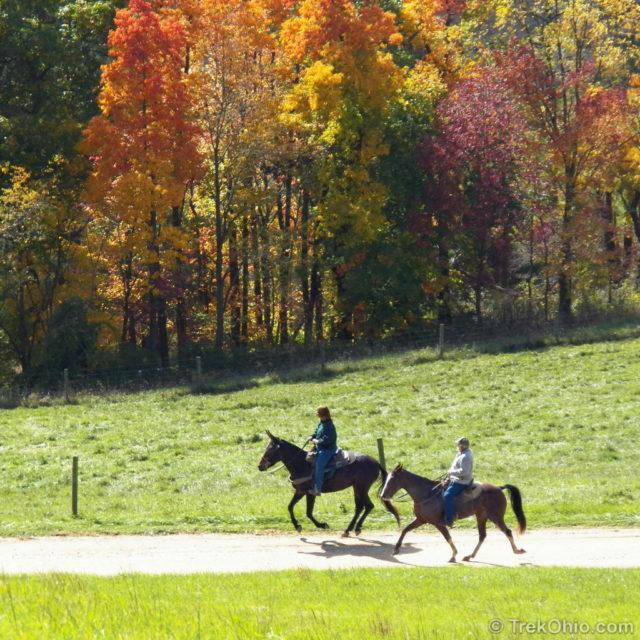 According to National Geographic’s article, Top 10 Places to See Autumn Leaves, Holmes County, Ohio is one of the top ten places in the world for enjoying fall color. If you like to cycle, there is an excellent bike trail in the county. 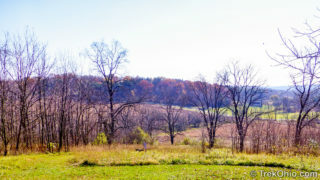 The area is a well-known site to experience Amish culture, whether that be food or crafts. 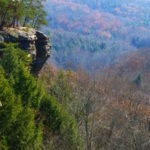 Check out Ohio.org/Fallidays for ideas on Getaways, seasonal events, activities, discovering haunted Ohio, and more. For a fun, family activity in October, consider a Halloween campout. For campouts and other activities, check out our list of Halloween Events at Ohio Parks for 2018. 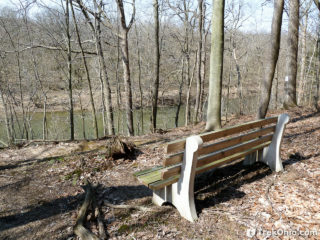 For details on the photo contest, check out OhioStateParksPhotoContest.com. If you’d like to see some of the places that we have visited in the fall, you can click on any of the photos below to find out more information, or you can look at a more extensive list of TrekOhio posts on fall color. 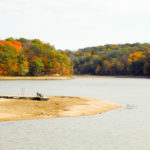 Share the post "Where and when to see fall color in Ohio"
Your third report would have actually been helpful if I knew what cities your guest was referring to in her recommendations. Just because she knows what cities they are in doesn’t mean your audience does. As it was she was of no value. I will see if I can get more specific information in the coming week’s update. Is there a 2016 version of this? We did not update the article this year (2016), but the links to resources and basic information is still good. Highland County, Ohio, southwestern How about this area, approx. what day is peak for the leaves to change? thx! Mimi, sorry I didn’t get back to you earlier. We were just in Highland County yesterday, and I would say that it is currently at peak color. WHAT IS THE BEST TIME FOR AMISH BERLIN AREA? Stephen, it looks like most of Ohio is going to be at peak color this weekend. 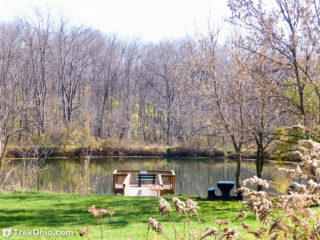 Check out the map at DiscoverOhio.com. Hello, this is a random request but wondering if anyone knows of a spectacular fall foliage location in Knox County for my family’s holiday card photo shoot? Thanks! I haven’t been at the parks in Knox County at peak fall foliage, however some places that come to mind are Wolf Run and Honey Run Highlands Park. 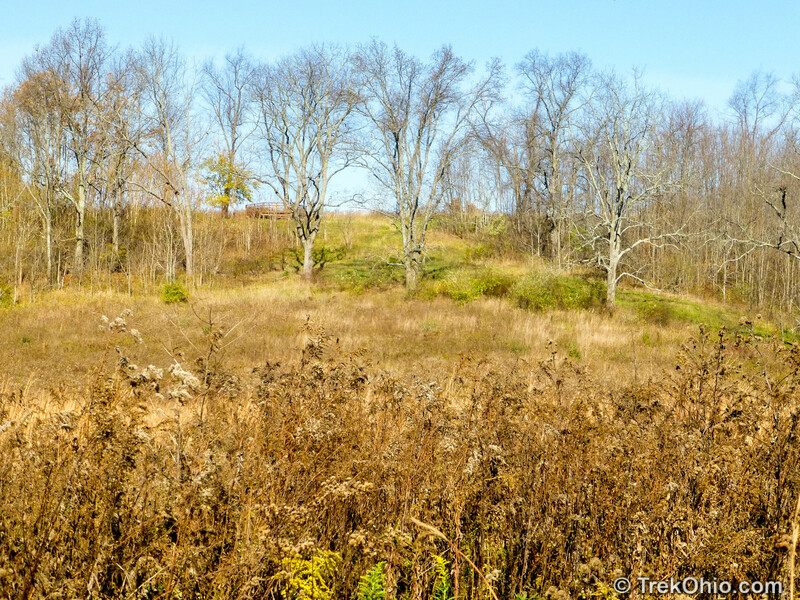 Although we haven’t written up Indianfield Bluffs, that might work, too (you can find its address on the Knox County page in our guide). 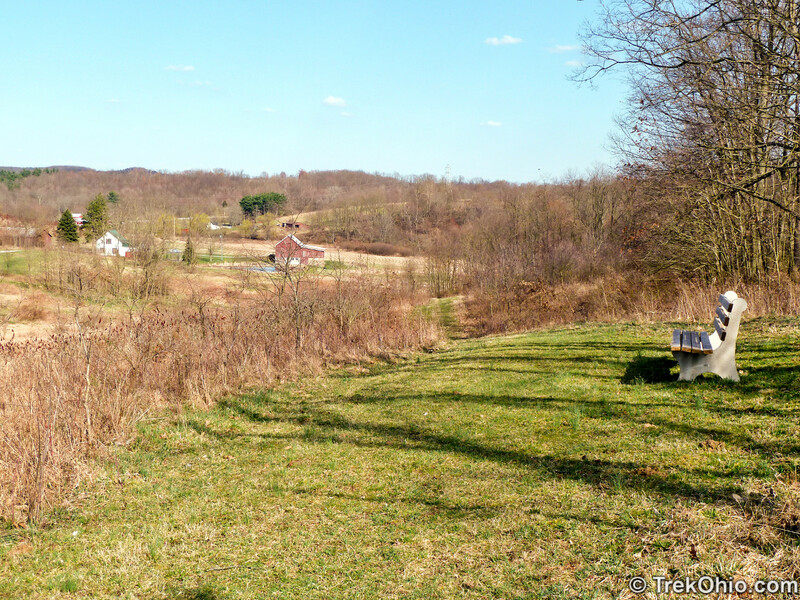 Wolf Run has rolling hills and a mix of fields and forests. There is also an overlook and a pond. 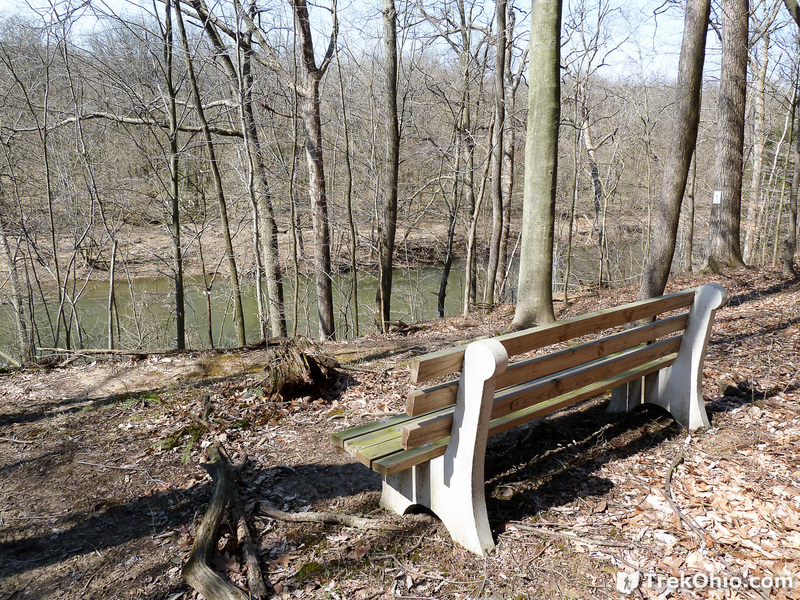 The observation deck at Wolf Run is located on the crest of the hill about 1/3 of the way over from the left. View from the observation deck at Wolf Run. 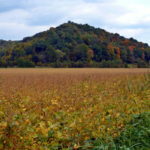 Indianfields Bluffs has a short trail. When I was there the leaves were not on the tree. Below is a photo of the bluffs. It is also possible to walk down to the edge of the water. 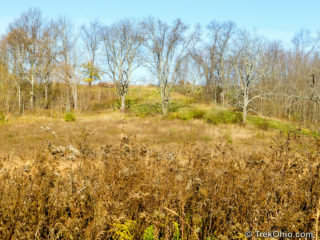 The bluff at Indianfield Bluffs. 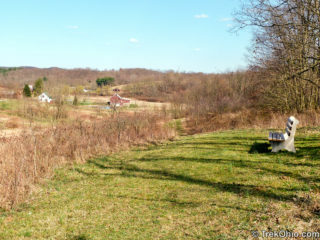 Honey Run Highlands Park has low, rolling hills, open fields and forests (both deciduous and evergreen). Below is a photo. If you like cycling, the Kokosing Gap Trail is excellent (more information on the Knox County page). Arnold, if this year’s fall color forecast turns out to be correct, peak color should be occurring in the northern third of Ohio (which I would say includes Lima) during the weekend of Oct. 17-18.